We provide custom logo design solutions for unique corporate brand identities. Logo designers at Digitalflex.co are experts in creating a memorable identity. Poster design is a field where artists and designers can really get creative, trying out ideas that would be too flamboyant or over the top for other mediums. Unfortunately, too many companies get stuck trying to build their brochures in Microsoft Word or Google Docs. Even if you have great content in your brochure, it won’t work well if your design doesn’t look professional. IT’S TIME TO CREATE SOMETHING GREAT! Oh! 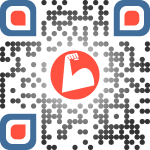 And yes, we also provide custom QR codes for your corporate or personal use!